Rojak is one of the most popular food in Indonesia after the Nasi Goreng. Moreover, in Java, especially in Malang. Rojak cingur usually consists of several kinds of sliced ​​fruits such as cucumbers, bengkoang, young mango and added rice cake, tofu and tempeh, and cingur bedoyo and vegetables such as sprouts, kale and beans. All the material was mixed with a sauce or condiment made from processed shrimp paste, a little boiled water to dilute, sugar, chili pepper, fried peanuts, fried onions and thinly sliced ​​banana green beans that are still young. All seasoning diuleg. In a presentation cingur salad can be divided into two types, namely ordinary and matengan presentation. Usual form of presentation of all the materials mentioned above, while matengan only consist of cooked ingredients only; rice cake, fried tofu, fried tempeh, bendoyo and water spinach, long beans, bean sprouts that have been simmering. Without fruit, because basically there are people who do not like fruit. 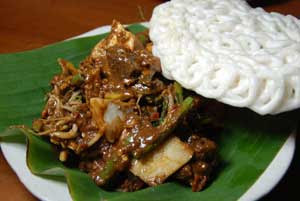 This food is called a salad cingur because the flavor of processed used is shrimp paste and sliced ​​cingur. This is what distinguishes the food salad in general are usually without the use of materials such cingur. Cingur salad served with extra ordinary crackers, and with the base Pincuk (banana leaf) or a plate.